July 27, 2010, 9:45 a.m.
By Megan Garber @megangarber July 27, 2010, 9:45 a.m.
– Websites experienced 3-5x greater click-through rates on the Like button when they included thumbnail photos of a user’s friends, enabled users to add comments (which 70% of top performing sites did), and placed the Like button at the top and bottom of articles and near visually exciting content like videos and graphics Sites that place Facebook social plugins above the fold and on multiple webpages receive more engagement. For example, sites that placed the Activity Feed plugin on the front and content pages received 2-10x more clicks per user than sites with the plugins on the front page alone. – Sites have used the Live Stream box to boost engagement with live video content. During the World Cup, there were over 1.5 million status updates through the Live Stream box on media websites such as Univision, TF1, ESPN, Cuatro, RTVE, and Telecinco. Whatever your current engagement with Facebook, and whether your particular news organization is staffed by 1,000 employees or one, the findings are worth attention. Here’s some more information on the data and how it was assembled. As far as Facebook itself is concerned, the new page seems devoted not just to data on traffic and interactivity and the like, but also to avoiding the trap that Google has found itself in and is now trying to rectify: an uncomfortable kind of awkward often oppositional relationship with news organizations. News outlets and social news platforms — or, more clinically, content providers and content distributors — used to be an us-and-them proposition. Now, though, we’re coming to a point where “social news” is not only common, but a redundancy. How could the news, we increasingly assume, be anything but social in nature? POSTED July 27, 2010, 9:45 a.m.
Garber, Megan. 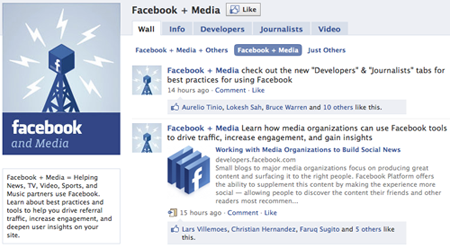 "Facebook launches a “Facebook + Media” page." Nieman Journalism Lab. Nieman Foundation for Journalism at Harvard, 27 Jul. 2010. Web. 24 Apr. 2019. Garber, Megan. "Facebook launches a “Facebook + Media” page." Nieman Journalism Lab. Last modified July 27, 2010. Accessed April 24, 2019. https://www.niemanlab.org/2010/07/facebook-launches-a-facebook-media-page/.